For the people who have returned to the ruins of East Aleppo the old phrase "there's no place like home" has a whole new meaning. The eastern side of Aleppo has been pulverised. Running water and mains power are a memory. It is hard to find a building that is not badly damaged. Many look as if they could collapse at any time. Rubble from the buildings that were flattened by artillery fire, barrel bombs or air strikes block many of the streets. Dozens of bulldozers have been working for more than a month to clear a path through the debris. East Aleppo remains a deeply inhospitable environment. But the UN estimates that 40,000 people so far, and more every day, have decided to come back here. They are moving into their old homes or unoccupied buildings that look as if they might do, for a while at least. Abu Hussein, a man in his 50s, was remarkably cheerful as he stood with his wife Umm Hussein and looked down from their balcony on to the rubble that makes his street impassable for any vehicle. "Nothing is better or more beautiful than our home," he said. "It's the place to be in good times or in bad." His family's flat is in Shaar, one of the poorest quarters in East Aleppo. The area is made up mainly of cramped concrete tenements five or six stories high - at least those still standing. In Abu Hussein's street, some buildings have collapsed in on themselves. Others have had the fronts ripped off, like dolls' houses in a nightmare, exposing beds still made up with sheets and blankets, and sofas teetering close to falling into the street. Abu Hussein said he was happy because he was home, even though his flat was dark and cold. His wife cooks on a small charcoal grill on the stairwell. The glass in the windows has gone. It is so well ventilated that the dank mist of a winter's evening seeped in. He had spent much of last year with his in-laws, he said, and the sooner they tried to make a go of it back home the better. 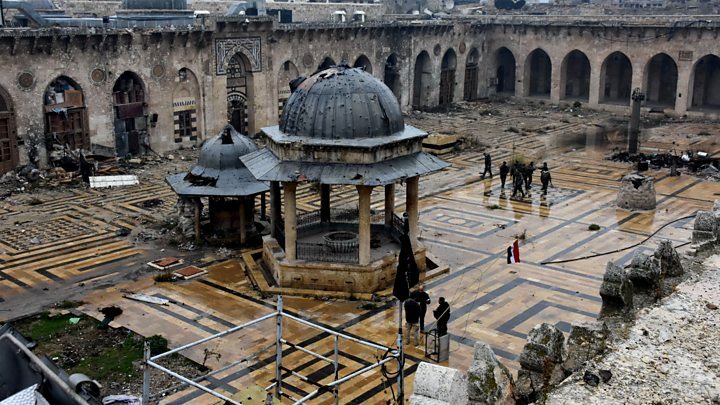 Media captionSyrian conflict: What's left of Aleppo's Great Mosque? Abu Hussein and his wife have a two-year-old son who is still with her parents. They have no jobs, and the small amount of money they had saved went long ago. "Of course we have hope," Umm Hussein said. "We'll rebuild and we'll find a solution." They left East Aleppo two days before the start last year of the major offensive by the Syrian army, backed by Russia and Iran, which by Christmas had beaten the rebels and reunited the city. During the years when the east was isolated, then besieged, it was possible to cross to government-controlled West Aleppo. Abu Hussein said the trip, which now takes 15 minutes, was possible for anyone who was prepared to take a 17-hour journey through territory controlled by Syria's galaxy of armed groups, including the rebel Free Syrian Army, Kurdish militias, the jihadists of so-called Islamic State, and the armed forces of the Syrian government. 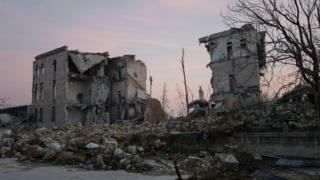 The United Nations, which spent more than $200m (£162m) on relief work in Aleppo last year, is particularly concerned that the poor in Shaar have come back out of desperation to a place that is still dangerous. Relief agencies have put water tanks in the streets. Children struggle through mud and rubble to help their families by carrying water home. Aleppo has changed since the government and its allies won the battle for the city last month. It no longer feels like a wartime city. Outgoing artillery fire is still a steady drumbeat, aimed at rebel front lines that are not far away. The country is at war. But Aleppo's war is over. In the ruins, people are thinking about the future. Slowly but steadily, some of Syria's millions of displaced people are returning, desperate or optimistic, or both. Large areas of the east side of the city are ghost towns, but there is every chance that more returnees will come back looking for a home once the weather gets warmer in the spring. The battle for Aleppo was the most decisive of the war. It is a long time since the war was merely a contest between President Bashar al-Assad and armed groups who wanted to destroy the regime. So many foreign powers have intervened that this has become an international conflict. Syria has layers of war and not all of them are about the future of the Assad regime. The intervention of Russia and Iran tipped the balance in Aleppo. Mr Assad and his allies can, for the first time, smell victory. Foreigners, not Syrians, are setting the pace. And at the moment it looks as if foreign powers will dictate how the war ends.